We are a national, all-purpose energy solutions company. We provide the best energy solutions in green technology and heating efficiency, reducing your bills and modernising your home. We install top of the range condensing boiler brands including Worcester Bosch, Ideal, Baxi and Vaillant. All our installers are Gas Safe and OFTEC registered, plus all our installs come with both manufacturers and workmanship warranties. 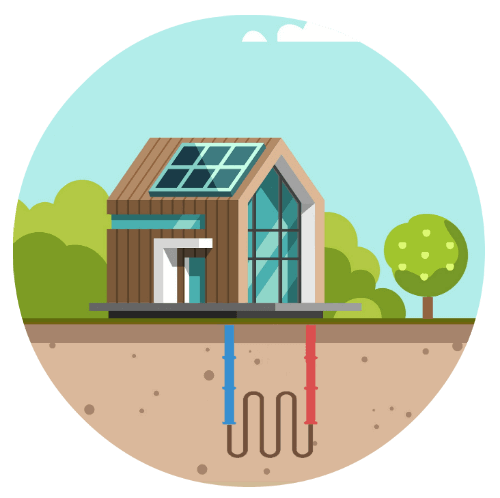 Generate your own energy and get involved in the renewables revolution with Heat Pumps and Solar PV. Installing Solar or an Air Source Heat Pump will lower your energy bills and provide protection against future energy price hikes. Improve your home by installing external or internal wall insulation, resulting in reduced heat loss. External and Internal Wall Insulation are two great ways to help create a watertight, aesthetically pleasing property. Get the latest smart technology and control heating with just a few clicks of your mobile phone. Help to reduce your energy bills by installing a smart thermostat, and control your heating and hot water via a smart phone app..
We also deliver tailored energy reduction solutions to the commercial and public sectors and have regional experts operating throughout the UK. Providing a variety of ways to upgrade the UK’s housing stock, helping homeowners and tenants benefit from lower energy bills, energy reduction and green energy initiatives to lower CO2. Energy conservation can play a vital element in any social housing enterprise, so why not lower your carbon footprint, boost your green credentials and start generating free energy for your portfolio. As a landlord, if your tenants receive income-related benefits, they may qualify for a variety of free energy saving measures via the ECO scheme. Upgrade your housing stock today. We partner with you to solve your energy challenges through expert guidance and tailored solutions. Our promise is to provide the right solutions for your home with the minimum of disruption. It’s why we have a 4.9/5 star rating from our satisfied and loyal customers. Our highly skilled team of engineers are not only knowledgeable, but also committed to providing the best advice specific to your requirements. From initial survey to installation, we maintain the highest level of competency, providing our customers with the standards they deserve. From the office to the warehouse, every one of our team members is dedicated to providing customers with friendly and honest advice. Our aim is to promote greater energy sustanability in both the domestic and commercial sectors and share our knowledge with our customers. Keep up to date with the latest news from Zing Energy, including our weekly blogs, social media updates and industry analysis. Contact Zing Energy today for a Free, No Obligation survey!